John Franell, a lifelong resident of Altoona, was an honor roll student in elementary school and sang in his local athletics club’s barbershop quartet when he was in high school. After graduation, he worked as a produce clerk and spent a lot of time in bars. He was arrested a few times—fighting, disorderly conduct, a little light larceny—and was conscripted into the combat engineers in 1942. After the war, John became a small-time thief, stealing crates of produce, frozen chickens and other groceries from warehouses and selling them cheap in bars and cafés. By the middle of the fifties, he had become a well-known figure in Altoona’s court house, and was told by a judge that he would face years in jail if he violated his probation again. 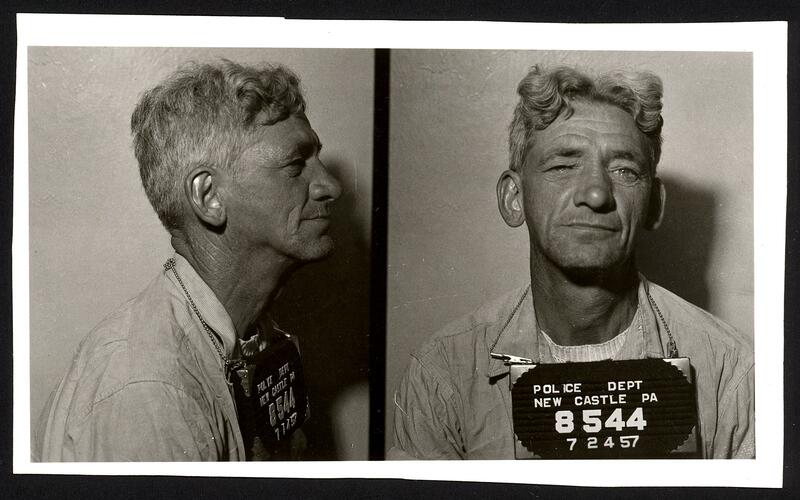 He left Altoona for New Castle, but his arrest for drunkenness in 1957 is the only record of his time in the city. He was back in Altoona by the following February, when he was arrested for burglary. John was homeless at forty-six, sleeping either in the streets, in the Rescue Mission or in the city jail’s drunk tank. Over the next few years, he was arrested for siphoning gas from a truck, stealing a car, burglarly, larceny and receiving stolen goods. He turned sixty while serving a three-year sentence in the workhouse. John was never arrested for theft again but appeared in court countless times on charges of drunkenness, disorderly conduct and breach of the peace. In August 1974, by which time he was known to everyone as Whiskey John, he was arrested seven times in four days. Every few months he was hospitalised with lacerations on his forehead, contusions on his head, abrasions on his arms, chest and sides and fractured ribs—all injuries that he sustained when he threw himself in front of moving cars. Once, a car crushed his foot and doctors had to amputate his toes. On April 4th, 1976, John was beaten to death in the hallway of an apartment where he was staying. He was seventy-one years old. There were no leads, and his killer was never found. Sources: Altoona Mirror (20 June 1918, “Irving Honor Roll”; 8 Oct 1929, “Logantown AC Plans For Annual Opening”; 25 Jan 1934, “Arrest Boys At Drinking Places”; 18 April 1934, “Four Autos Are Reported Stolen”; 5 Aug 1934, “Men Fined $100 For Scene On 11th Street”’; 22 Jan 1943, “Join Engineers”; 29 Dec 1952, “Defendants To Enter Submissions In Court”; 7 May 1953, “Vagrant Given Term In Jail”; 29 Sep 1953, “Grand Jury To Weigh Evidence”; 1 Feb 1958, “Arrest Trio For Two Burglaries At City Plant”; 6 Oct 1959, “Four Caught Stealing Gas”; 15 June 1960, “3 Altoonans Captured In Stolen Auto”; 7 July 1960, “Three Altoona Men Sentenced To Workhouse”; 2 Oct 1963, “Work Of Grand Jury Nears End”; 1 Feb 1964, “Hospital Treats Varied Injuries”; 2 June 1964, “City Hospital Treats Injuries”, 15 Feb 1966, “City Hospital Treats Injuries In Dispensary”; 12 March 1966, “Hospital Treats Varied Injuries In Dispensary”; 29 Jun 1966, “Fall Victims Admitted To Mercy Hospital”; 17 Dec 1966, “Altoona Hospital”; 2 Sep 1969, “Hospital Treats Varied Injuries In Dispensary”; 29 Sep 1969, “3 Hurt On Blair Roads; Loss $12,680”; 14 April 1970, “Men Fined In Police Court For Disturbance”; 14 April 1971, “Held For Misconduct”; 22 April 1971, “Hospital Treats Varied Injuries”; 21 Jun 1971, “Hospital Treats Varied Injuries”; 29 Oct 1971, “Misconduct Case Delay Laid To Police Mixup”; 16 Oct 1973, “City Man Jailed For Misconduct”; 26 Aug 1974, “Altoona Hospital”; 17 May 1987, “Unsolved Homicide Cases Still Baffle Police”); Tyrone Daily Herald (26 Aug 1974, “News From Altoona”; 5 April 1976, “News From Altoona”; 8 April 1976, “Death Ruled Homicide”). Poor guy. I want to give him a quid for a can of Special but that wouldn’t help either. Hard to know what would. He finally got the death he had wanted for so long. But it took 71 years to come. Sometimes you just have to marvel at how harsh life can be. And how important it is, not to forget, amid the iPads and the Androids and the websites and the distractions, that people suffer. I think it makes us a little kinder to each other, to have these reminders. You’re quite right, I think. Also, it’s tempting to try to imagine what might have happened to a guy like this to turn him into such a ruin, but you have to accept that there is rarely any one thing that you can point to in someone’s life as being the cause of it all.